ISO9001/ISO14001 | REX INDUSTRIES CO., LTD.
Rex has been ISO 9001 certified since 1998 and ISO 14001 certified since 2003. We are working on numerous activities to improve customer satisfaction and develop products that are good for the environment. 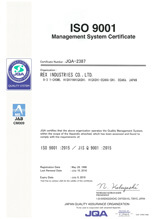 ISO9001 was upgraded to ver. 2000, which indicates how important Customer Satisfaction (CS) is to us. Rex gathers 2,000 sets of data from end users every year, analyzes the information with regard to our products and service, and makes every effort to improve our CS. - To develop Rex' identity and to build a first-class company offering outstanding value. - To tirelessly pursue customer satisfaction and to improve the quality of corporate management. "Individual awareness will save the planet." This is the principle upon which Rex' environmental policy is built. We manufacture products that are eco-friendly; for example, the roll thread head series which reduces the use of cutting oil and wastage of steel pipe. Rex has adopted the 3R* concept against steel wastage and packing materials that are produced during manufacture. 1. We shall contribute to environmental preservation through all our activities. 2. We shall establish an environmental management system to protect against pollution. 3. We shall adhere to environmental laws and regulations, create our own standards and regulations, and improve our management system. 4. We shall reduce wastage, recycle materials, and save energy and resources. Material analysis equipment designed to test compliance with the EU directive on RoHS (Restriction of Hazardous Substances). tests for the ratio of impurities such as lead, mercury, cadmium and hexavalent chrome. activities under the concept of "quality first".